Back in the summer of 1972, Dave Barrett hit the campaign trail and started changing the mindset of British Columbians about socialism. After his historic win, he went further still, and literally transformed the provincial landscape by introducing the Agricultural Land Reserve. The act was is designed to increase food security, but like many other initiatives, it was at risk from the very start. In the best of summers, Dave Barrett ran the best of campaigns. Up against the seemingly unbeatable W.A.C. Bennett, the NDP leader was as unruffled as the weather, relaxed and purposefully out of the media spotlight. Forty people at a small gathering in Houston, a brief visit to the distant mining town of Stewart, a mid-morning tea in mighty Yahk, mainstreeting in Revelstoke. 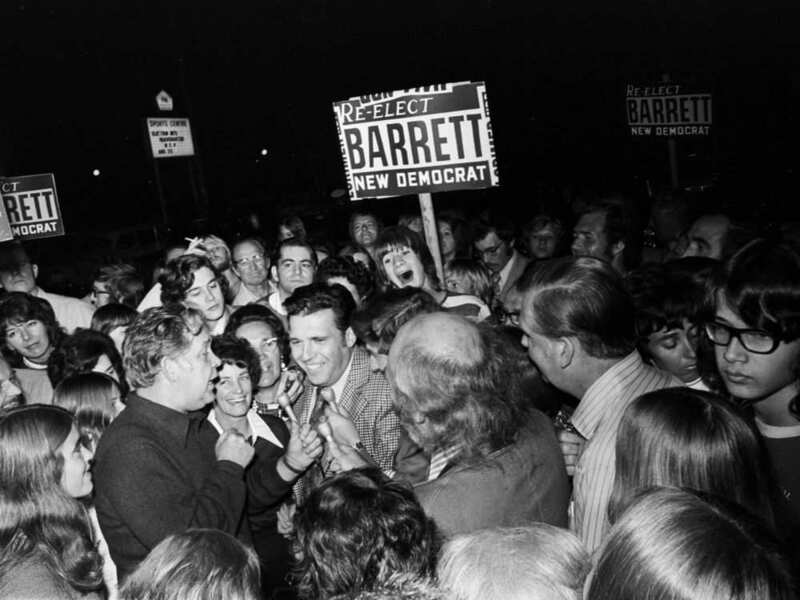 It was all the same to Barrett, part of his strategy to defuse once and for all Bennett’s tried-and-true election fear mongering about the “socialist hordes.” Of course there were hard-hitting political speeches at larger public meetings, but none of them predicted victory. He simply refused to be a target. But the best joke he told on himself. In Prince George, he advised the audience that an astrologer, asked by a local Vancouver newspaper to assess various attributes of the four provincial leaders, had given him a good mark for “sexual proclivities.” Rather pleased, Barrett told the tittering crowd he phoned home that night and asked his wife Shirley if she’d seen anything interesting in the paper. “No, Dave,” she reported. “Just the same old lies.” It brought the house down. Socialist Crush: Dave Barrett moves through the delirious throngs on victory night. During a brief, 18-day fall session, the minimum wage was raised 33 percent to $2 an hour, teachers were given bargaining rights, budget responsibilities were restored to local school boards, a broad-based committee was struck to bring democratic reforms to a legislature that had operated under W.A.C. Bennett’s one-sided version of the rules for two decades, and most significant of all, the government brought in Mincome, guaranteeing seniors a minimum income of $200 a month. The pioneer program, unmatched anywhere in North America, is “the unfinished work of the socialist movement in its concern for people of all ages,” proclaimed Norm Levi. Pretty well the Barrett government’s first order of business, Mincome remained its most popular measure for all the time it was in office. It didn’t last of course. The bitter fights to preserve B.C. farmland from development, bring in public auto-insurance, tax windfall mining profits, dramatically increase spending on social services for the disadvantaged and enact a myriad other controversial measures aimed at making the province a more enlightened place to live evoked large protests and sometimes over-the-top opposition in the media. The inevitable government gaffes, coupled with more than a few missteps by Barrett, himself, did not help. By the time the NDP was voted out of office three years later, that early glow was but a memory. Looking back, those faults pale in comparison with the rich legacy left behind, a legacy that is with us still. None is greater than the preservation of farmland throughout British Columbia. Forty-five years later, the Agricultural Land Reserve stands as a beacon to what a committed government can do to change a province. (My list of the Barrett government’s 100 achievements, over those short 39 months, is available here.) B.C. never had a more alive, activist government. The summer of 1972 made it all happen. As he is remembered at a state memorial in Victoria and a gathering the next day in Vancouver, for all his accomplishments and fighting the good political fight for so many years, that’s when Dave Barrett did the impossible. By “slaying the Socred dragon,” as The Vancouver Sun’s front page headline put it, and refusing a cautious, go-slow approach, he set B.C. on course to a modern future from which there was no turning back. Check out the Mannix-like intro for Webster! and his full interview with Dave Barrett from 1982. Courtesy of the Royal BC Museum. For more about British Columbia and food security, visit the government sponsored gateway here. No Replies to "Neither Waffles nor Pancakes, Dave Barrett's Proof was in Pudding"